There’s a gap between mobile time and ad spend. Will it narrow? 24 to 8. It’s not an American football score, but rather the key finding for mobile marketers published by Mary Meeker of Kleiner Perkins in her 2015 Internet Trends report. To be more precise, Meeker finds that Americans spend 24 percent of their media time, which includes TV, print, radio, and internet, on their mobile devices. She also estimates that advertisers spend eight percent of their budgets on mobile marketing. She concludes, therefore, that this mismatch of time spent and advertising spent represents a $25 billion opportunity for the mobile marketing industry. 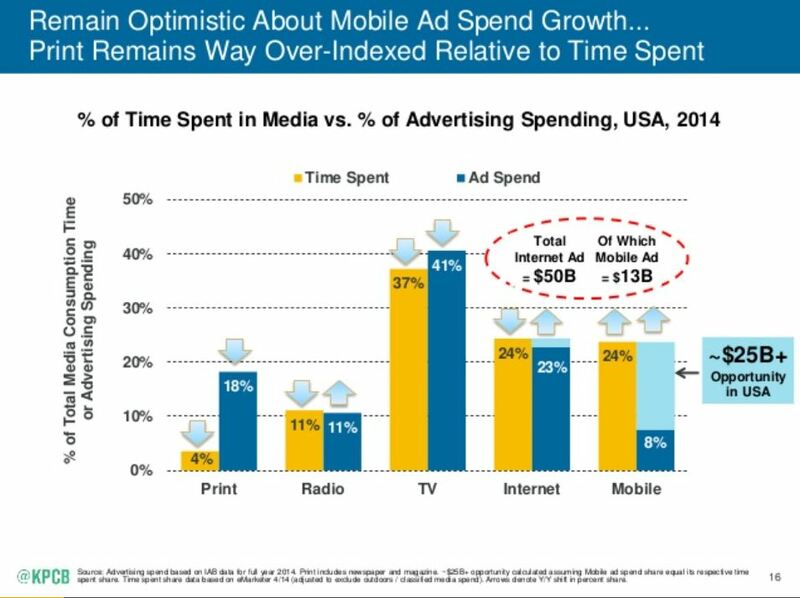 After all, the time spent/advertising spent data matches pretty evenly for radio, internet and TV. It seems only reasonable, therefore, that eventually mobile and print (which has attracts 18 percent of spend but only a depressing four percent of time) will equilibrate. Not so fast, says Mike Shields in a blog for The Wall Street Journal. Perhaps the reason this mobile marketing gap persists has everything to do with rational behavior. Maybe marketers know exactly what they are doing, meaning they have other marketing choices that produce better return on marketing investment than mobile. To make his point, he attacks the crux of Meeker’s argument: the linkage between time and advertising. He points out, for example, that mobile games, which accounts for about one out of every three minutes we spend on our phones, doesn’t lend itself well to advertising. Small screen sizes make for lousy billboards, and they can’t possibly match the immersive video experience found in today’s high definition televisions. So who’s right: Meeker or Shields? The answer depends on a combination of what you believe about what I’ll call marketing inertia, fear, and the future of marketing innovation. The fact that TV, radio, and internet time and advertising spend matches so well suggests the inevitability of equilibrium. Perhaps we can explain the gaps that exist today as a result of inertia. Marketers just might be slow to change. It’s easier to take last year’s marketing budget, increase or decrease it depending on expectations of revenue growth, and redeploy the same marketing playbook. Marketers also could be afraid. In most companies, drastic actions raise all sorts of alerts if not alarms. Moving significant amounts of money from an established, safe channel to one that is still as new as mobile would expose whomever pulled the trigger to scrutiny. Even though the mobile migration is nothing if not drastic, a marketer could be forgiven for being skittish about spending accordingly. Shields makes valid points that paint a more charitable picture of today’s marketer. Much of mobile’s advertising inventory has flaws. Ads may not belong in many of the ways we use our phones. Mobile videos by definition are smaller and often shorter than their TV counterparts. All these things suggest limitations on just how effective mobile marketing can become. If you believe that mobile represents an inherently limited platform that will always carry a time-ad spend deficit, then join Team Shields. If, on the other hand, you believe that gaps between time and ad spend will narrow; that new ad formats, especially in-feed units by the likes of Facebook that take up the entire screen and can accommodate video solve a lot of the problems that trouble Shields and others; that innovation won’t stop because Silicon Valley thrives when it applies technology to solve problems other industries have created, then welcome to Team Meeker.